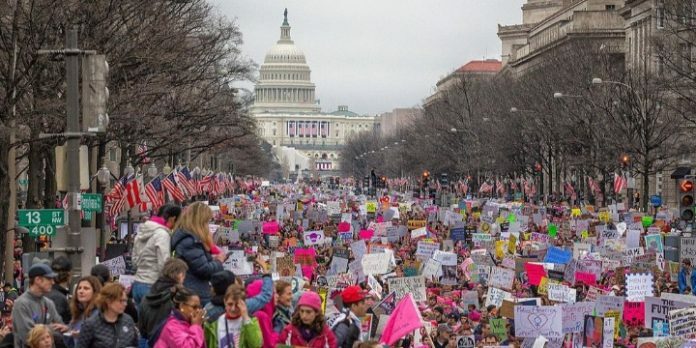 Protesters attend the Women’s March on Washington in January, 2017. Photo: Mobilus In Mobili. In a petition launched on Friday and signed by some 120 people, Women’s March For All (WMFA) said that antisemitism — “often cloaked as anti-Zionism” — “has now become a serious problem in liberal movements worldwide,” including in Canada and the United Kingdom. The group was formed out of the 2017 Women’s March on Washington, after the movement’s leaders — Tamika Mallory, Linda Sarsour, and Carmen Perez — came under fire in March for their praise of Louis Farrakhan, the Nation of Islam leader who has railed against “Satanic Jews” and been accused of sharing misogynistic, homophobic, and transphobic views. Nisi Jacobs, who helped draft that petition, later went on to launch WMFA. 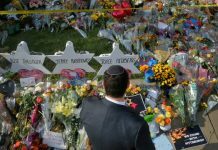 The group has since drawn attention for its critique of antisemitism in left-wing spaces, as well as for its fundraiser on behalf of the Occupy Lafayette Park protests outside the White House, which has raised more than $13,000. “Due to overwhelming support for our objective, our numbers grew and we evolved into a watchdog and action group. Maintaining affiliations with persons or organizations that promote homophobia, antisemitism, misogyny, and transphobia or Islamophobia is unacceptable for any progressive group,” the group’s website states.